Welcome to Shades ETC's blog. My purpose for this blog is to inform you of what I'm currently creating in the home decor. I will post pictures of products as I'm making them so you can see them from start to finish. I'll tell you where I'm going to be displaying my products so if you are in the area you can come and see them in person. Come on in, grab a cup of tea, and let your eyes light up at the exquisite creations you see. I just finished added the silk flowers to this violet teacup and saucer lamp. After I was done, it looked like wild flowers had grown up together and so I named it Wild Violet Teacup. The teacup and saucer have violets all over. 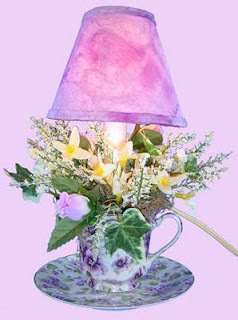 The handmade lampshade is hardback and covered with lavender batik fabric. The electric candle lamp has on/off switch on the six foot cord. It uses a 7-watt candelabra bulb. It measures 10-1/2" tall. You can purchase it on my website at http://www.shades-etc.com/teapot.htm for $30 plue shipping or at my shoppe in Bemus Point, Exquisite Things Gift Shoppe, 4957 Main Street, Bemus Point, NY 14712. Shades ETC is the place for exquisite, one-of-a-kind gifts for home decor. Perfect for house warming gifts, Mother's Day, birthdays, these products made for those special people in your life. Shades ETC also provides the service of recovering old, hard-to-find lampshades. Give us a call or visit our website at http://www.shades-etc.com. Merry Christmas! - A little Christmas Message from Tizzalicious and DaWanda! If you have your own DaWanda shop, you can customize your own video here.